At Schwall Builders, our architectural and design/development services ensure the cost-effective, quality construction of your new home or addition to your complete satisfaction. We’re good builders because we’re good listeners first. The open, two-way communication that will run throughout your project starts early, with the opportunity to talk through your project directly with our owners. And as we move through the design and development phase, we continue to listen, meeting with you regularly while meticulously crafting and refining designs that meet your ultimate approval. With an experienced architect and our team of design specialists, we can help simplify and streamline the sometimes confusing and always complex design and construction process. We’ll work with you to define your project, determine a preliminary budget and help you find the most cost-effective way meet your goals, integrating the dreams you have with the quality results you deserve. We’ll help bring your “wants” and your “needs” in line with your budget realities and find the best way to minimize costs without compromising quality. We’ll analyze your site and investigate local municipal building and zoning codes to identify any physical or legal restrictions on your property. If there are issues, we’ll devise appealing and practical solutions that meet your desires as well as all other requirements. 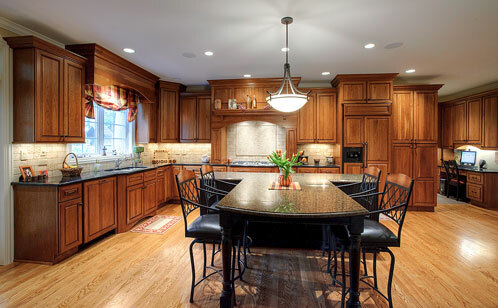 There are countless big and small choices you’ll be making along the way, and our consultative approach means you’ll have as much support as you want, whether it’s the placement of your home on the property, the location of the basement bathroom, or the perfect fixtures for your kitchen sink. We even can help design the landscape and exterior grounds to enhance the look, security and privacy of your home.